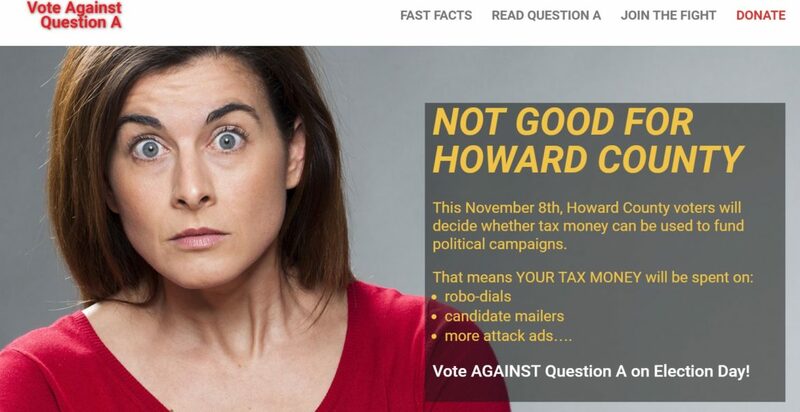 This is the home page of a group opposing Question A in Howard County that provides for public financing of local election campaigns. Howard County Executive Allan Kittleman told MarylandReporter.com he opposes the public campaign financing charter amendment on county ballots this year because it would force him to use taxpayer dollars to fund candidates. “There’s no question I support public financing of local campaigns,” Kittleman said, but only if it comes from voluntary contributions, not tax dollars. Kittleman was responding to an Oct. 5 article in MarylandReporter.com about the proposal to finance races for Howard County executive and council with public money. The proposal has gained statewide and national attention from a coalition of groups because it is the first time public financing of local races has been put on the ballot as a separate issue. The coalition supporting public funding estimates that it would cost $2.5 million in the 2022 election. Supporters concede this is less than is currently spent on competitive races for these offices. “[The] goal is not to ensure a candidate using matching funds can outspend all competitors; [the] goal is to stay competitive with enough funding to get the message out,” says the outline for the proposal. Howard County Council member Jon Weinstein, the lead sponsor of the charter amendment, said Kittleman’s opposition was no surprise, since Kittleman had told him that privately in the spring when the council was reviewing the measure. The administration did not publicly oppose the proposal, but the lone Republican on the five-member council did vote against it. “Any system that works involves taxpayer dollars” in some fashion to ensure that the funds are available to candidates as promised, Weinstein said. Weinstein said it was interesting that Republican Larry Hogan was the first to successfully run for governor using public financing. He pointed out that Hogan in this year’s budget proposed replenishing the campaign finance fund with taxpayer dollars. According to a legislative budget analysis (page 13), Hogan wanted to put $1.8 million from the general fund into the campaign finance fund that had previously been filled only with voluntary contributions from an income tax check-off. That check-off was repealed in 2010, and $1 million was taken out of the campaign fund for other uses. The voluntary check-off was restored last year. The legislature cut $790,000 from Hogan’s proposed funding, and replenished the campaign fund with $1 million to replace the money from the fund that had been taken for other purposes. Hogan and Democrat Heather Mizeur were the first candidates for governor in years to tap the fund for $2.6 million. “In one election, they wiped it” out, said Weinstein. Under the Howard County proposal recommended by the coalition of groups, an independent commission would make funding recommendations to the county executive and County Council for annual appropriations to ensure the program is available for qualifying candidates in the 2022 election cycle. Voters would also be allowed to make a check-off on their local income taxes to fund the program, with the rest of the money coming out of the county budget. The sponsors and the coalition are proposing that donations to candidates be limited to $150, with the first $50 from a donor matched six-to-one for executive, or four-to-one for council. Candidates for executive would have to raise $40,000 on their own before being matched, and candidates for council would need to raise $7,500. Matching funds from the county would be capped at $750,000 for executive and $75,000 for council. Montgomery County already has public financing for local campaigns in place for the 2018 election, but the council there did not have to seek voter approval for the plan. With campaigns funded using tax dollars, Kittleman said an unwilling taxpayer could wind up paying for a robocall from a candidate they oppose. The 2022 election was chosen as the first one to use the campaign fund so there would be enough time to fill it. He pointed out that because of the council’s three-term limit, he is the only current member of the County Council that would be impacted by the campaign financing. “It’s either self-serving or self-defeating,” Weinstein said. To make the voluntary check-off on personal income tax returns possible for Howard County, the legislature would have to act since the state collects the local piggyback tax. In 2014, according to a report from the comptroller’s office (page 37), about 143,000 tax returns were filed in Howard County, but only 119,000 owed taxes. If half of those filers made voluntary contributions of $5, that would raise only about $300,000 a year, less than half of what would be needed in a four-year cycle. “I think we see the people studying the issue,” Weinstein said, and he hopes voters will approve it. While proponents have been very visible under the umbrella of FairElectionsHowardCounty.org, there is also a committee called Howard County Citizens Against Question A chaired by David Loeffler of Laurel, with Bradley Myers of Hanover as treasurer. Myers is also treasurer of Kittleman’s campaign committee.